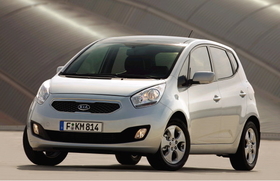 Kia hopes the Venga will win sales from buyers of the Ford Fusion, Opel Meriva and Citroen C3 Picasso. SENAGO, Italy -- Kia hopes its new Venga small minivan will help to boost its sales in a European market that the automaker expects to decline between 8 percent and 10 percent this year. The Czech-built Venga is Kia's second model that was designed to be built and sold only in Europe. The Cee'd compact car was the first. Paul Philpott, Kia Motors Europe's chief operating officer, said the Korean automaker aims to sell 50,000 Vengas this year. "We hope this will increase our sales in Kia's western Europe region to 252,000 units from 242,000 units in 2009, the same level we reached in 2008," Philpott said at the model's Italian market launch here on the outskirts of Milan. Last year, Kia sold 330,000 cars across western and eastern Europe including Russia and Ukraine. Philpott said Kia expects moderate growth this year at 10,000 units or about 4 percent, which would be a significant achievement in a declining market. "We expect the market to decline between 8 and 10 percent this year unless the UK and Germany take action to extend or renew scrapping incentives," he said. Philpott expects the Venga to benefit from growing sales of small minivans, but said he is worried that heavy discounts on Ford's aging Fusion minivan and Opel's soon-to-be-replaced Meriva could hit Venga sales, adding that he considers the Citroen C3 Picasso the strongest rival to the Venga at the moment. The Venga went on sale this month and is priced between 14,900 and 19,800 euros in Italy. The Venga is the first Kia model built by the parent company Hyundai Motor Corp. in its European in Nosovice, Czech Republic. Kia will introduce the new generation of its Sportage medium SUV at the Geneva auto show in March, but Philpott does not expect the new model to boost Kia's sales. "SUV sales in Europe declined 50 percent last year and have been on a slide for a number of years," Philpott said. He said the core of Kia sales in Europe will remain the Cee'd family, accounting for more than 95,000 units this year, and the Picanto minicar, which is expected to sell between 45,000 and 50,000 units. Philpott said the new Sorento SUV, unveiled at the 2009 Frankfurt auto show, is expected to increase its sales to 12,000 this year from 11,500 in 2009.